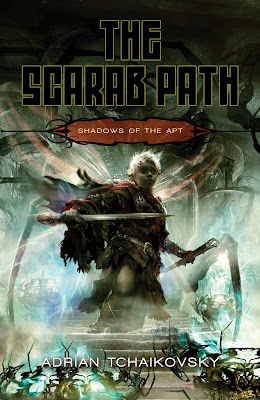 I was a bit underwhelmed by the cover initially making the rounds for Pyr's edition of The Scarab Path, especially after the stellar job they've done with Shadows of the Apt series up till now. Which is why I was happy to receive this gem. While not as action packed as Empire in Black and Gold or as neat as Blood of the Mantis it keeps with the previous style and certainly gives a sense of presence. I do question the black title with such a thin line of color just because it may be hard to read from afar, but it looks as though Che is finally getting some cover love after 4 books.. Avoid the below blurb if you're not caught up on the series. I agree about the black on black choice of font but I do think its a major improvement from the first attempt. The eyes are quite odd, but it goes along with the general description of Che's race.